Our nursery is situated in the heart of the Cambridgeshire Fens with as many as 500 varieties available to see over a site of 350 acres. Our tree nursery offers interest to all for whatever reason you are looking to plant trees. The tree nursery at Barcham not only offers an opportunity for us to showcase our product, it is also the key component to producing our trees to the high quality that people have come to expect from us. The range of activities that are performed on site is vast and varies greatly throughout the growing season. The following gives a brief summary of the site activities that are performed upon the nursery at Barcham Trees. First and foremost, the most important activity that is performed at the nursery is the production of our unique container grown trees. This process is initiated with the influx of fresh stock predominantly coming from our fields throughout the winter season to be potted into the Barcham Light Pot™. Prior to containerisation all trees are checked against the Barcham quality requirements and those that do not meet the designated standard are rejected. In recent years many trees have been imported by British nurseries with unwelcome pest and diseases such as Oak Processionary Moth and Ash Die Back which has led to government intervention and importation bans. Biosecurity is an important driver for us at Barcham with all of our trees regularly inspected by outside agencies to attest for their vigour and quality. Importantly, no stock is imported for immediate resale so we know that our biosecurity code cannot be breached. 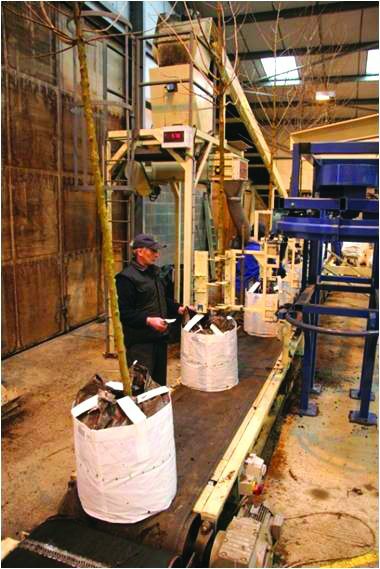 Smaller trees are potted using the Barcham Trees potting machine which is automated and capable of potting hundreds of trees in one working day. Larger trees must be handled manually as they are too big to fit into the potting machine. These larger trees are often transported to their designated slot on the nursery and then potted in situ. The potting process with the use of the Light Pot™ is the method which enables us to produce our trees to such a high standard. The rigorous checking prior to potting ensures that quality can be assured from the very beginning and from then on we let the roots do the work! Development of the root system with our Barcham Light Pot™ is the next stage of tree production on the tree nursery. Once they have been potted, the trees are placed in their respective slots on the tree lines and given until the following autumn to develop their root systems. The beds and slots upon which the trees are located throughout the nursery are fully equipped to provide each tree with all that it needs for growth and root development. Here at Barcham we have an extensive irrigation system that supplies the entire nursery. This irrigation system is fed by two reservoirs that have the capability to hold up to 72,000m³ of water which are filled during the winter period using run off from the nursery and the water is then distributed to all of our trees during the summer period. 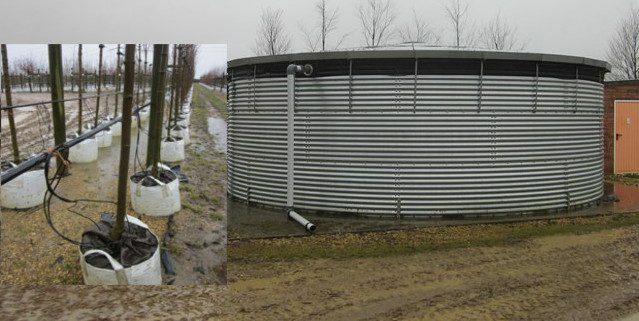 The water is fed to the trees using four drippers that are positioned in the top of the container, one in each quarter, to ensure that water is evenly distributed throughout the container and thus this is reflected in even root development. The water which is fed to the trees is treated before it enters our irrigation system. This prevents pathogens from spreading to the trees causing disease and facilitates the uptake of nutrients. During the summer period liquid feed is also added to the water prior to irrigation; this varies in quantity and depends upon the requirements of the trees throughout the season. A dedicated irrigation team vigilantly monitor the irrigation system when it is in constant use ensuring that every tree has access to the water it needs at all times. Once the root system of the trees are fully developed they become available for general sale. 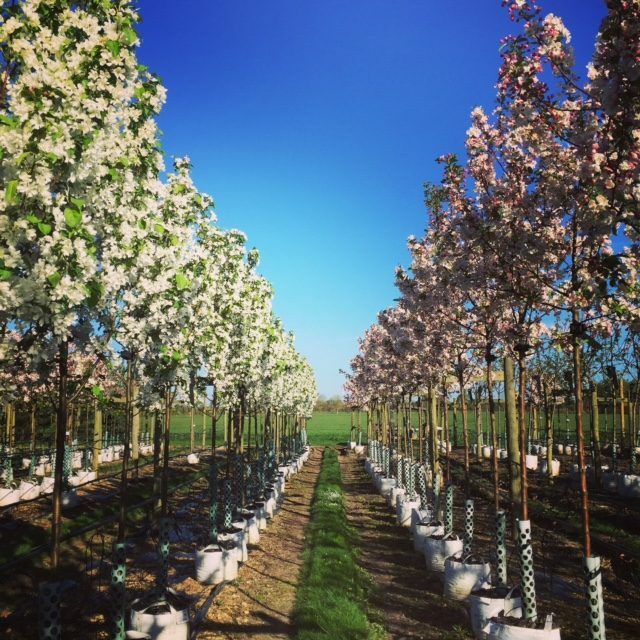 Orders are received by the head office at our nursery and a member of the specialist selection team then choose the trees to meet the requirements of each order. 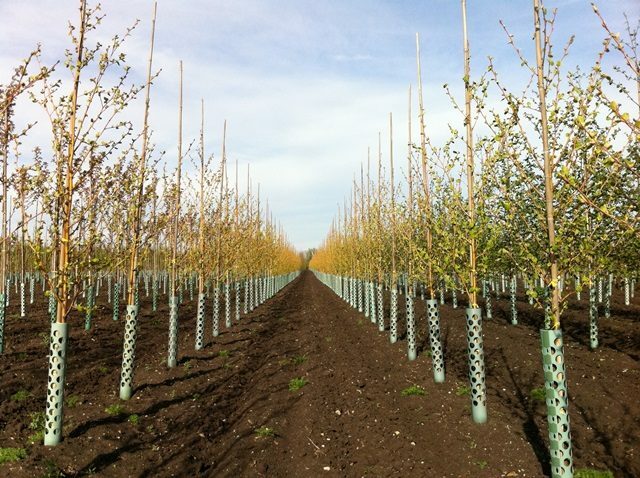 At this point the trees on the nursery are once again subjected to rigorous quality checks and if any trees do not conform to the required Barcham standard, they are not selected for orders. Using a skilled selection team whom are conversant with the standard that Barcham Trees expects enables us to ensure that the quality of the trees picked for all orders is consistent and ultimately our customers are fully satisfied. The dispatch process follows stock selection and this involves the use of a team of people and some heavy machinery. Following selection, a list of tree locations is produced for each order; this is then given to the dispatch team for lifting. The trees are then transported from their places on the tree nursery lines to the dispatch yard. The dispatch yard is an area of the tree nursery where activity is rife and during the winter months there is a constant flow if vehicles coming and going for loading and delivery. The vehicles that we use vary from smaller flat bed rigid lorries to large articulated curtain sided lorries and the vehicles selected can usually be tailored to individual customer requirements. Trees are loaded onto the lorries and are laid down flat on their side. If they are on a flat bed lorry, they are then sheeted over prior to beginning their journey to prevent any damage occurring whilst in transit. Additional to the standard Barcham service we can provide a quote at cost for the use of a lorry equipped with a hiab crane that can be used to unload trees directly into pre-prepared planting pits. This is usually only something that needs to be considered for our semi-mature specimen. The tree nursery at Barcham is available for viewing by appointment only; but don’t let this put you off.